A giant loud speaker, now exhibited at the Battlefield Tourist Park in Dadeng Island, Xiang'an, Xiamen, China is reportedly the World's Largest Loudspeaker. A Chinese sign near the Loudspeaker proclaims it as "The world's largest military broadcast speaker". The huge loudspeaker has a diameter of 2.28 meters (about 7.5 feet), is 4.74 metres (about 15.5 feet) long and weighs 1588 kg (1.7 tons). When functional its peak output was whopping 20,000 watts and sound from it could be heard up to a distance of 12 km. The Dadeng Island on the southeast coast of the People's Republic of China has often been referred as the "Last Frontier Island". Dadeng along with two other adjacent small Islands namely Xiaodeng and Jiaoyu islands played a strategic role in the defence of the Chinese mainland in the late 1950s during the Taiwan Strait Crisis. These three Islands aka known as "3 Hero Islands" were heavily shelled from nearby Jinmen Island by KMT forces of Taiwan. In turn the Chinese had also heavily shelled the Taiwanese Jinmen Island about 5 km away. In addition to the military action, both sides had also carried to heavy voice propaganda and psychological war across strait by using giant loudspeakers and this giant loudspeaker is a remnant of those days. Reportedly another such loudspeaker with about 100 holes, due to hits from shell fire across the strait, is on display at the Military Museum of the Chinese People's Revolution in Beijing. These broadcasts which lasted for about 38 years from 1953 and 1991 are often referred as voices of the "frontier broadcasters". A nice article and first hand information from the broadcasters who had worked here can be read in Women of China. Note: This loudspeaker is not to be confused with World's Largest Megaphone/Speaking Horn (4 metres long with horn diameter of 2.3 metres) at Avenue de Stalingrad, in central Brussels, Belgium. 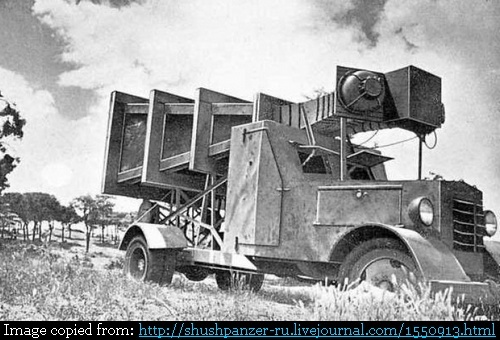 It is worthwhile to note that during the Spanish Civil War, a huge truck mounted loudspeaker (shown below) was used to transmit morale boosting speeches to the soldiers in the trenches. The speeches included speeches of "La Pasionaria", (Ms. Isidora Dolores Ibárruri Gómez) - a Spanish Republican leader of the Spanish Civil War and communist politician of Basque origin. I am not aware whether this loudspeaker still exists or has been destroyed. Edit Note: Based on the additional information the text of the original post has been greatly modified. Earlier there was some doubt whether this is the largest loudspeaker or not, However the additional information confirms that it is The Largest.